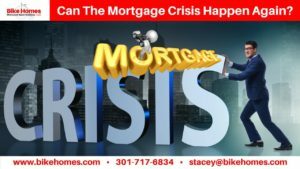 You might remember the subprime mortgage crisis that began around 2007 and might be wondering to yourself if that could ever happen again. I have been reading and researching lately about mortgage default rates and trends which leaves me wondering if the United States could ever have a mortgage crisis like the one that occurred in the early/mid 2000s. In another article posted on CNN.com entitled, “Are we Heading Toward Another Subprime Mortgage Crisis,” Mr. William Poole (former president and CEO of the Federal Reserve Bank of St Louis) provided commentary and opinions on the current mortgage market. Mr. Poole is concerned that we are headed to another housing crisis. While the increase in defaults, delinquencies and foreclosures may alarm some, as note investors, this presents us with an opportunity to help. As we invest in non-performing notes, we can help home owners stay in their homes and work with the borrower who wants to make payments, but may not have been able to work with the bank or the bank may not be willing to work with the borrower. By helping the borrowers stay in their home and getting them to re-perform on their note, we are helping our communities stay healthy and free of blighted properties. So, what are your thoughts? Bike Homes stands ready to help borrowers stay in their homes to the extent possible by investing in promissory notes backed by real estate. We are always looking for Joint Venture Partners who are looking to put their Self Directed IRAs or Investment Funds to work for them. Whether you are looking for a passive return on your money or a more active role in your investment, we have a wide array of investment opportunities available. By investing in notes backed by real estate, your investment becomes recession proof. We can help you turn your investments into win-win solutions. If your investment dollars are not performing to your needs or expectations, I encourage you to reach out to us to learn how you can earn potentially double digit returns on your investments. If you would like more information about Bike Homes or how we can help you turn your investments into profitable solutions, I encourage you to reach out to us at Stacey@bikehomes.com or visit our website at www.bikehomes.com. You can also catch up with us on one of our many social media accounts including Facebook or LinkedIn.